The guitar is one of the most common instruments for beginner musicians. It’s fun to play, and with practice and dedication, most students can learn to play several easy songs rather quickly. David Joel teaches both acoustic guitar lessons and electric guitar lessons in Philadelphia. He teaches in a methodical way that engages the student and allows them to learn at their own pace, in their own way. They can then take his teachings and find a genre that is fitting to them. David works with his students on tunes in a variety of styles of music including rock, blues, jazz, pop, folk, country and classical. Learning guitar is a lot of fun, and with the right lessons, anyone can become a great guitar player. Finding the right instructor is the core of this process. Learning from someone who is experienced in all facets of guitar playing is the key to becoming the best player you can be. David Joel has been playing and teaching guitar in the Philadelphia area for decades. One of the important things to understand when looking for a good guitar instructor is to make sure this person knows the difference between playing and teaching. He is equally amazing as an instructor. He wears both hats well because he knows the difference between the two. He plays in his own way, with his own technique. He teaches fundamental basics so that the student will find their own style and technique. He knows not to force his talent on someone but, rather, his teachings. Some may ask, why not just take a lesson online? It’s cheaper, sometimes free and I don’t have to leave the house. The answer to this is: because you can’t really learn this way. It shouldn’t be a surprise that students learn faster when taking private guitar lessons or classes, compared to watching video tutorials or ‘how to play guitar’ YouTube videos. 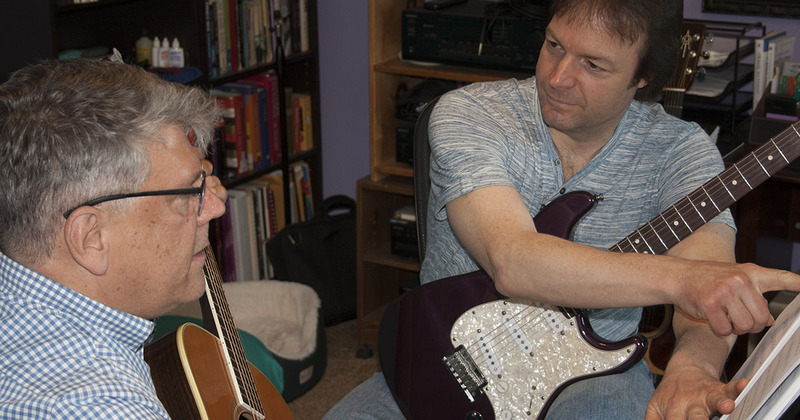 Finding a specialized teacher for one-on-one lessons will give you the feedback and personal attention you need to become the best guitar player you can be! You can’t get that attention to detail from an online video! David is a former Berklee College of music instructor. He offers weekly, one on one instruction, teaching you the music you want to learn. Whether you are a beginner or more experienced guitar player, let David help you take your guitar playing abilities to the next level. The David Joel Guitar Studio in Philadelphia is just the place you need if the guitar is the instrument you are striving to learn. You won’t be disappointed with David’s teachings, and you will be amazed at what you learn! Call David today and learn about his sessions, pricing, and teaching techniques. You’ll be glad you did!